When you have to compete for attention with a traditional tabletop projector, the cables and noisy fan can derail your presentation. 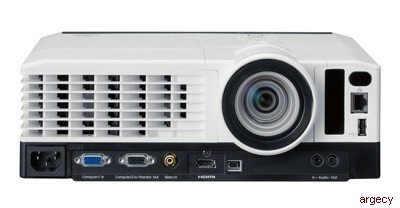 Ricoh's PJ WX3351N wide-format desk-edge projector can be placed at the front edge of a table, well away from the participants, who will be free to focus fully on you -without distractions. To protect corporate information, you want to keep guests on the guest network and employees on your secure network. With the PJ WX3351N, you can accommodate both. It comes with standard wired and wireless networking that lets everyone in the meeting access the information they need. The projector also comes with Miracast connectivity, so you can mirror screens from Android and PC smart devices. Sometimes you want to market a project creatively, get people's attention in an unexpected way, or spice up a training session. With the PJ WX3351N, you can use the 360-degree installation angle to project on the ceiling or floor. Keystone correction automatically fixes any image distortion. 40" - 400"/30.3" - 481.9"
1 Overall mean values for product at time of shipping are indicated in accordance with the JIS X6911-2003 data projector specification format. 2 Preset to this range of supported signals. Signals not present by display even if they are within this range. 3 When using the USB terminal for computer-free presentations, there is no guarantee images will display. They may not display because of the file. 4 Not supported on 64-bit version. Warranty: The Ricoh Desk Edge Series is under warranty against defects for a period of three years from the date of purchase. Consumables are under warranty for a period of 90 days from the date of purchase or until depleted, whichever comes first. Please refer to warranty documents shipped with the product for more details. For maximum performance and yield, we recommend using genuine Ricoh parts and consumables. The Ricoh Desk Edge Series is under limited warranty against defects in material and workmanship for a period of three years from the date of purchase. Consumables are under warranty for a period of 90 days from the date of purchase or until depleted, whichever comes first. Please refer to warranty documents shipped with the product for more details. For maximum performance and yield, we recommend using genuine Ricoh parts and consumables.